Rodeos have a long and vibrant history. 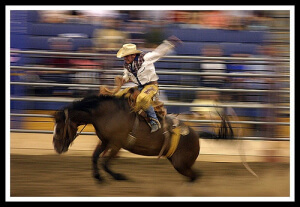 The roots of modern rodeos can be traced back to the late 1700s and 1800s. Spanish ranchers who settled in Mexico brought over many of their ranching techniques and taught them to their Mexican ranch hands, also known as vaqueros. As Spanish influence waned in the 1800s the vaqueros moved north and passed on much of their knowledge to Americans moving out and settling the new western frontier. As the West was settled nearby ranches began holding informal competitions between their outfits to see who was the best at doing ranch chores. Chores like breaking horses and roping cattle provided the basis for the modern day events that we see in rodeos. Many cowboys began to find themselves out of work as trains spread toward the west coast and the range lands were fenced in around the time of the American Civil War. The solution for these cowboys was to travel around and exhibit their skills in Wild West Shows, and local rodeos. In the early days the performers in the two shows were one in the same. The rodeos of this time period were still almost completely unorganized, which led to much confusion. Rodeos were put on by local communities and there was little communication between them. Many of the competitors didn’t know what events were being offered, or even what the rules were going to be until they arrived and paid their entry fees. In the early 1900s rodeos began to be structured more and more by official rodeo organizations. These organizations put together a formal set of rules and judging guidelines. Eventually Wild West shows fell on the wayside and rodeos became more and more like we see them today. Rodeos were actually one of the first sports to have a dedicated governing body with the creation of the Rodeo Association of America(RAA) in 1929. Today we have the Professional Rodeo Cowboys Association(PRCA) which puts on the famous National Finals Rodeo every year in Las Vegas. From Memorial Day to Labor Day, Jackson Hole, has a rodeo every Wednesday and Saturday night. Rodeos have been popular on guest ranch and dude ranches, like Goosewing Ranch, for generations. Rodeos have changed quite a bit over the years, but it’s fun to think about how rodeos have transformed from a simple competition between neighbors to the competitive sport it is today. The ‘invention’ of steer wrestling can be attributed to just one man, Bill Pickett. It is the only event that can be attributed to only one person.